The river levels for the Chili Bar and Gorge runs on the South Fork of the American River are primarily determined by the releases from Chili Bar Dam. Caution: Flows fluctuate depending on rainfall and temperature, and the gauges may not always be accurate. Refer to the daily flows to see the pattern, but don’t make your final boating decision until you’ve looked at the water. 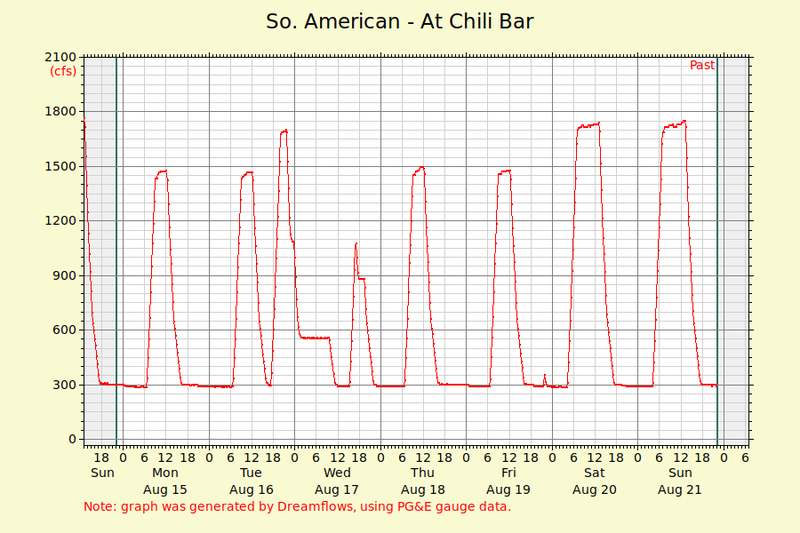 The following graph shows today’s releases from Chili Bar Dam in cubic feet per second (cfs). It reflects the river flow right below the dam at the given times. It takes approximately two hours for the water to travel from Chili Bar to Coloma, and three hours to Camp Lotus. At higher flows, the water travels faster, and if it is raining, the flow downstream may be swollen by side creeks. Thanks to Dreamflows for generating this graph from data provided by PG&E. For several years, SMUD and PG&E have agreed to supply predictable recreational releases through most of the year. See the schedule for this year at Dreamflows or South Fork at Kyburz – Updated weekly, with infomation on interpreting the gauge. Chili Bar’s reservoir is fairly small. Upstream from Chili Bar is Slab Creek Dam and its larger reservoir. Slab Creek Dam spills when the elevation of the reservoir reaches somewhere around 1848-1850 feet; at that point the flows that are filling up the reservoir behind the dam start moving through. See SMUD’s Slab Creek page for more information and current reservoir levels. See the El Dorado County River Management website for a table that describes how whitewater boating challenges change as the South Fork of the American River level changes.